Today is Shaun’s nine year work anniversary. This means that nine years and two days ago I tearfully hugged friends and family goodbye and stepped onto a plane at Lindbergh Field. After about three hours, we stepped off a plane at the SeaTac Airport and set off for a bold new adventure. Despite the fact that I’m a Navy brat, I grew up living in one house. When I moved out, it was to an apartment only a couple miles from my childhood home. I stayed in that apartment for years, switching out my roommate for Shaun. I even gave birth to one of my children in that apartment. (I have mentioned that I don’t like change, haven’t I?) The thought of moving away…from my parents, all my friends…everything I had ever known, was terrifying. I knew this was an opportunity that we couldn’t pass up though. We had always discussed moving to a more family friendly environment, I guess deep inside, I didn’t really think it would happen. I can remember coming out of the airport with a couple of suitcases, two small children and a cat. We drove down the 405 in our rental car armed with nothing but a map to our temporary housing. Soon we came to a city with tall skyscrapers on either side of the freeway. I excitedly told the girls that we were in Seattle. Shaun, who had been out here on his interview, gently informed us that this wasn’t Seattle, but only Bellevue. I sat there gazing around me in wonder. I was trying to imagine how big Seattle could be if a town I had never heard of was this big. About the candy? Apparently there is a company tradition that on your anniversary, you bring in a pound of candy for each year you’ve been there. I’d never heard of this before. (in fact the girls and I were wondering if he was making this up) It seems that Shaun’s current team is one of the few that actually observes this tradition. What a fun way to celebrate. So, here’s to nine pounds of candy! This entry was posted in A Family Affair, Adventures, Random stuff. Bookmark the permalink. Happy Anniversary and Congratulations to you all! 9 pounds?! I’m getting fat just thinking about it lol. I love Seattle… The fresh market, the crisp air. There are so many beautiful places to live. You live in one of them. And yet there are a lot of people who chose to stay in the UGLY places, like South Bend IN. Bleh. And have a great weekend girl! Ya know, I like M&Ms, but 9 pounds?!? Wow. Congrats on the anniversary and thanks for sharing such a happy moment with us. Congrats on the anniversary. I’ve never been to Seattle but I’m totally convinced that I would really love living there. 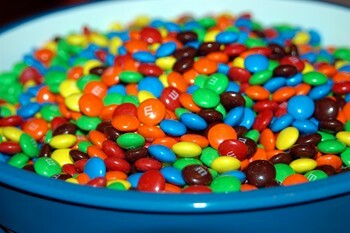 9 pounds of M&Ms? Holy Cow! Was only in Seattle once but LOVED IT! I think I would like Chelle P’s part of the world too. It sounds like it is the perfect place to raise a family and I’m basing that on the corporate traditions in your part of the world – like 9 pounds of candy for an anniversary. Shaun must work at a caring place. What a grand idea to commemorate the anniversary of your arrival. A pound of candy for each year is a fun way to do that. Washington sounds wonderful; someday I plan to visit. I know what you mean about change. Shaun reports that his big bowl o’ candy is about half gone. He sent an email out to the whole team filled wth nostalgic memories (such as not having a computer for his first week…now he has like 7) and people were streaming in all day. Kinda cool!